The whole Turkish nation and the nation of Israel who loves Turkey, will be forever grateful to you"
Forever grateful to you..! Is that not an interesting statement? 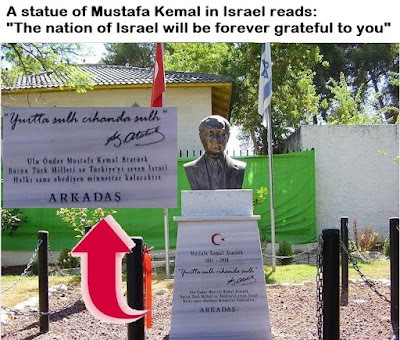 Why would the Zionists be grateful to Mustafa Kemal? We would like to remind you that the Zionist State of Israel was founded less than 10 years after Mustafa Kemal's death. That certainly is not a coincidence. Zionist movement started in late 19th century in Europe and greatest challenge to the Zionists to establish an independent Jewish homeland in Palestine was the Islamic Ottoman Empire which officially resolved in 1924 in the hands of Mustafa Kemal and his companions. In order for the Zionists to reach their goal, the first thing to get out of the way was the Ottoman Empire and the Islamic Khilafah. Are the Zionists grateful to Mustafa Kemal because he made Palestine available for them? The monument is erected at the yard of an association called "Arkadash" which means "Friend". The Arkadash Association is located in Yehud-Monosson, Israel and it was founded by Eyal Peretz in 2003. The association purports to preserve Turkish Jewish heritage and promote friendship between Israel and Turkey.